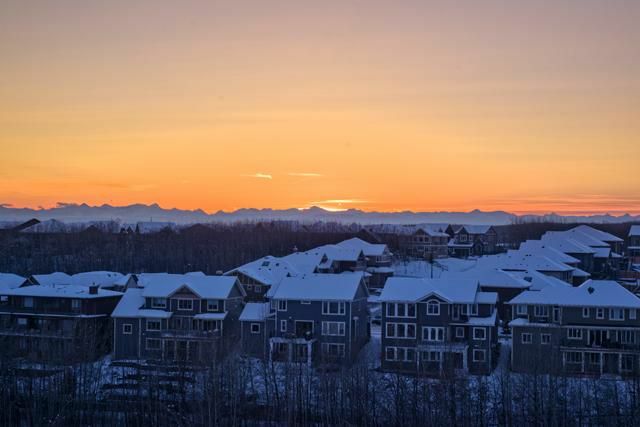 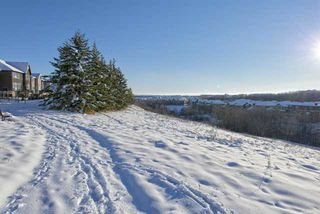 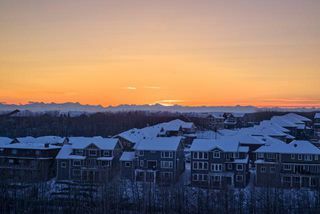 Spectacular upgraded executive home on a PIE LOT backing onto a GREEN SPACE with PANORAMIC MOUNTAIN views, the ultimate location. 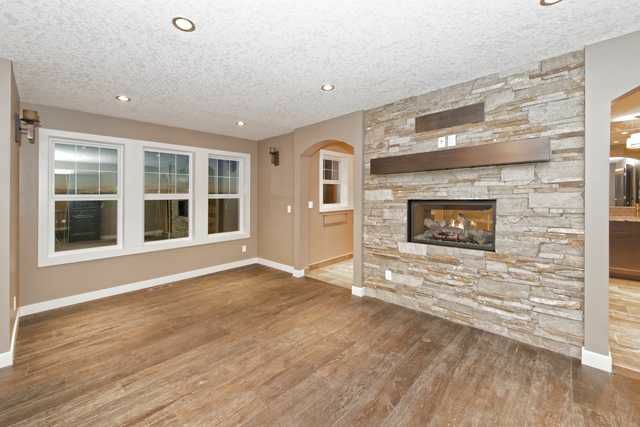 Main floor boasts a front den, dining rm accented by a two sided gas fireplace trimmed by a wall of stone. Rear great rm showcases a wall of windows allowing for tons of natural light. 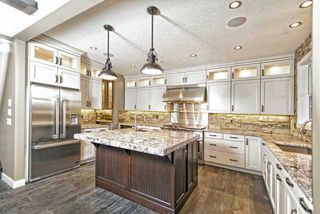 Stunning adjacent kitchen features granite counters, stone backsplash, two sinks, ultra-exclusive DCS stainless steel appliances, butler pantry w/ bar fridge and enormous walk in. 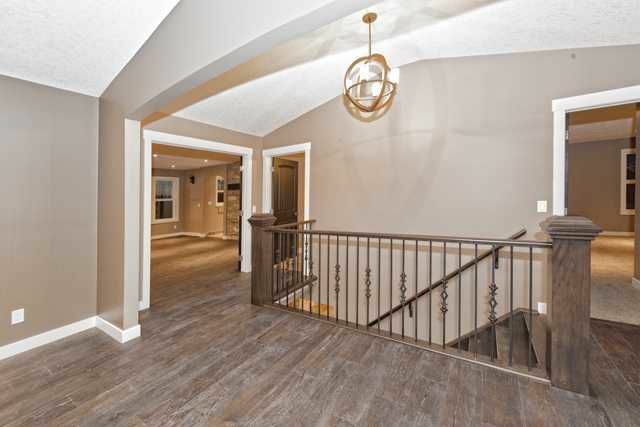 9'(on main) knockdown ceilings, "farm house" engineered hardwood throughout. Upper level offers three bdrms each w/ ensuite bathrooms and walk-in closets in addition to a spacious bonus room w/ vaulted ceiling. 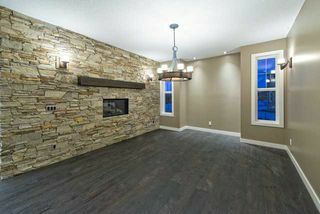 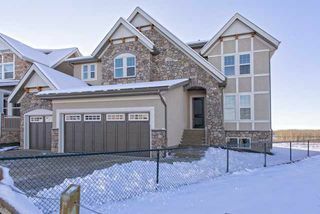 Amazing master bdrm offers a second two sided gas fireplace along with numerous west facing windows w/ mountain views. 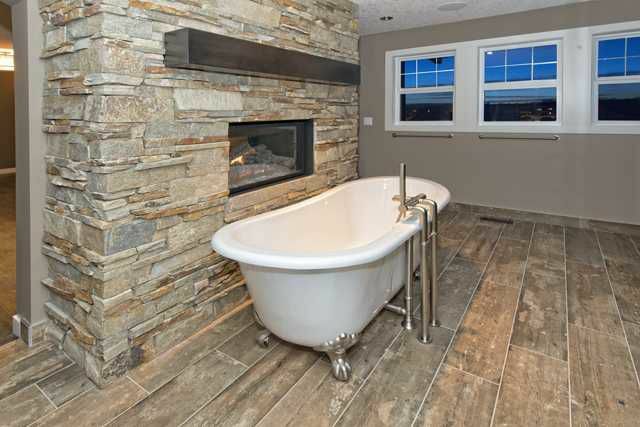 Executive ensuite spa is accented by dual sinks, claw foot tub, oversized shower w/ multi head fixture, heated floors and fabulous walk-in closet w/ loads of built ins. 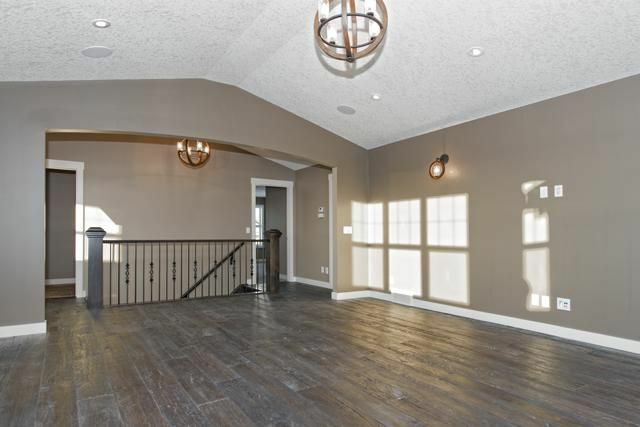 Quad attached garage. 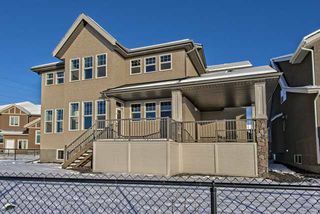 Stunning upgraded executive home on a pie lot backing west onto a green space on a quiet street with panoramic mountain views. 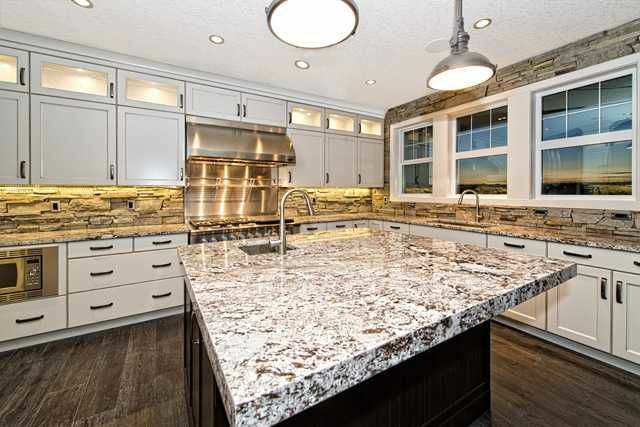 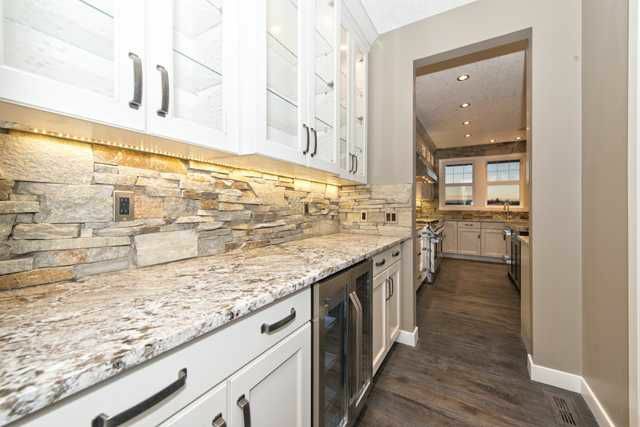 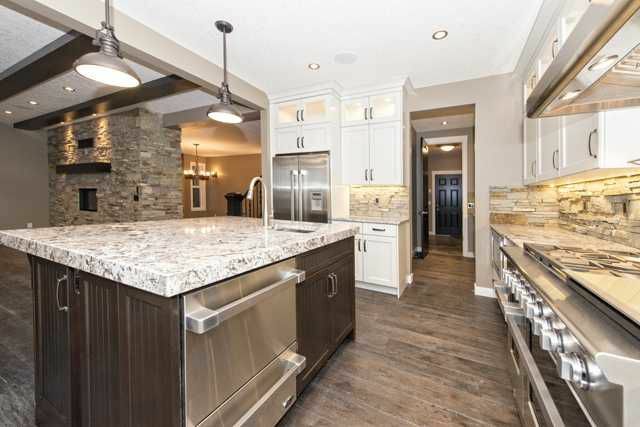 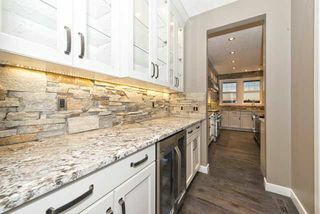 Loads of cabinets with upper cabinets having glass accent doors along with two stainless steel sinks (prep sink in island) and extensive use of stone throughout the back splash. 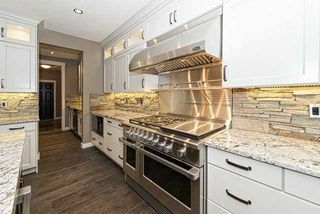 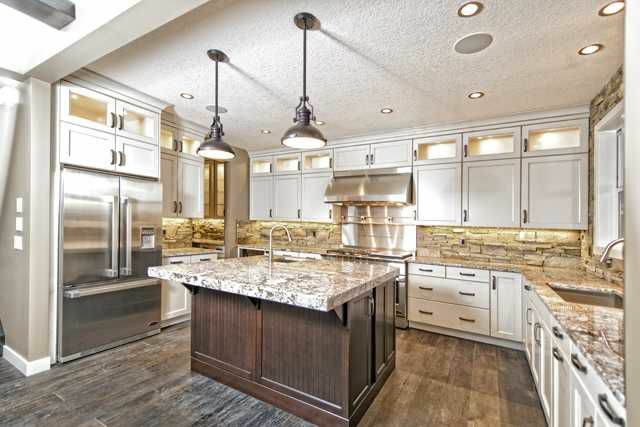 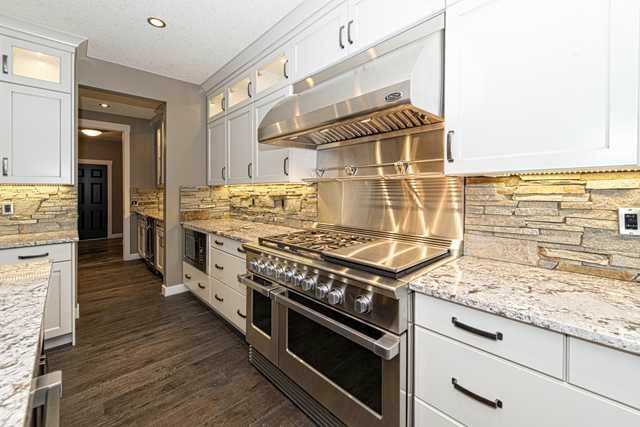 Under cabinet lighting along with ultra exclusive stainless steel DCS appliances including gas stove, dishwasher, built in microwave, fridge and bar fridge. 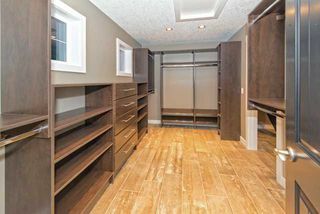 Butler pantry with additional cabinets, bar fridge and enormous walk in. 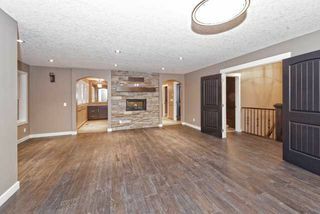 Den with double doors and "farm house" engineered hardwood floors. Two sided gas fireplace trimmed by a stone wall with mantle also having custom upgraded lighting and cantilever for a hutch. Extensive use of pot lighting with accented ceiling, opposite side of two way gas fireplace from dining room with mantle and TV mount wood bracket. Accented by vaulted ceiling, multiple TV mount locations and wired for sound with built in speakers. 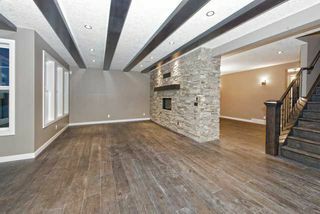 "farm house" engineered hardwood with two sided fireplace with mantle and TV wood bracket. 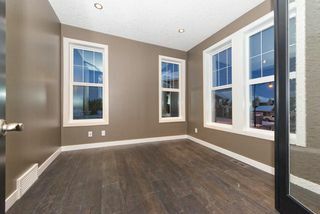 Loads of west facing windows allow for tons of natural light and showcase the panoramic mountain views. 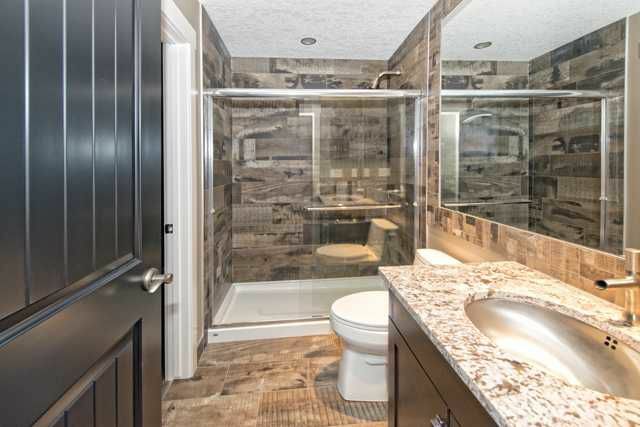 Dual sinks, heated floors, tiled back splash, over sized shower with six sprays and rain shower fixture. 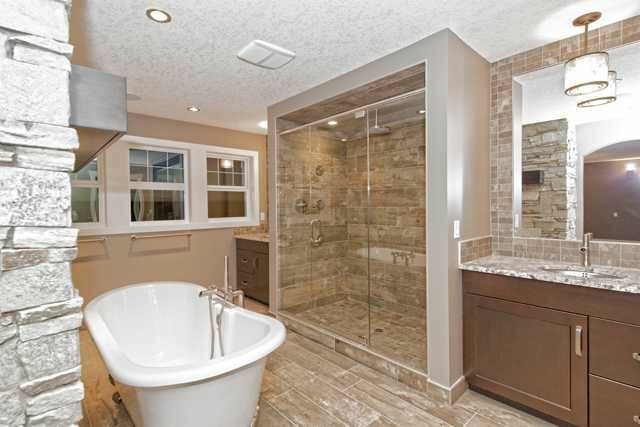 Stand alone claw foot tub. 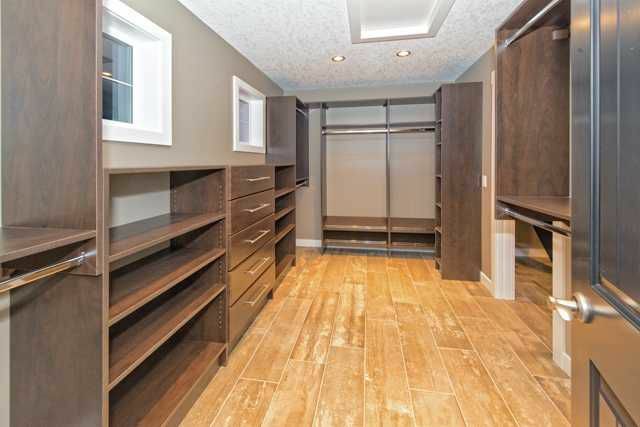 Huge walk in closet with loads of custom built-in cabinets. 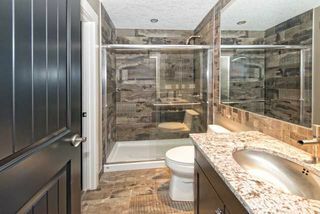 Green space behind the home allowing for ultimate privacy.